My first reaction on learning there were old mine shafts hidden in the Black Mountain canyon was disbelief. I had grown up in the area, but the most interesting sites I had known about were mediocre waterfalls in Rancho Bernardo and Rancho Penasquitos. An exploratory mine? Sign me up! Scouring the internet I learned that back in the 1920’s, a district was created in the area for the purpose of mining arsenic. Arsenic was a valuable chemical used to eradicate boll weevils that were infesting Southern cotton crops. To pull arsenic from the ground, Escondido rodeo cowboy and actor Frank Hopkins set up a mining camp in Rancho Penasquitos, and so it began. It seems that within a few years, farmers began to get a handle on boll weevils and demand for white arsenic declined. By 1927, the mine had been abandoned, though the remnants and mine shafts still remain. Here is where we enter. Using my GPS I was able to located the mine’s flume through Google Maps and used that as a guide through my phone to easily track the path to our destination. The tracking device helped to ensure us that we were going the correct way and I highly recommend using one if you decide to go. There is the slightest evidence of a path which is just enough to let you know that you’re going the right way. This is a rugged, off-the-traditional trail hike and therefore it is extremely important that you come prepared. Cover up as there are ticks! I know this because when I got home one was burrowing itself into my leg. Bring a backpack with regular safety gear and let someone know where you are going. I cannot stress enough the importance of thorough research before you go on these types of adventures as well as coming prepared for the variety of situations that you could encounter. Personally, these types of hikes are my favorite because they are off the beaten path. It adds to the excitement knowing not too many people have done this adventure and yet the slightly trampled ground tells you it has been explored before. We went the long way and later learned that there was a much quicker way to get to the flume. Through our path we found several beer cans that looked like they were from the 1970’s. One was filled with bullet holes too, evidence that the area was once used for target practice. On our first visit to the area we were unaware of the open mines a little further down the path. Exploring the flume and its immediate surroundings was more than enough to satisfy us. We hiked inside the flume which was incredibly stupid and I do not recommend anyone exploring inside it. Once we were maybe a quarter of the way inside, an internal panic set in but at the point it was pretty much too late and so we headed all the way through. I got this feeling that the flume could collapse at any point which is why I am telling you to not go inside—it is foolish. After this trip, I began doing even further digging on the internet to find more information on this mine and its history. 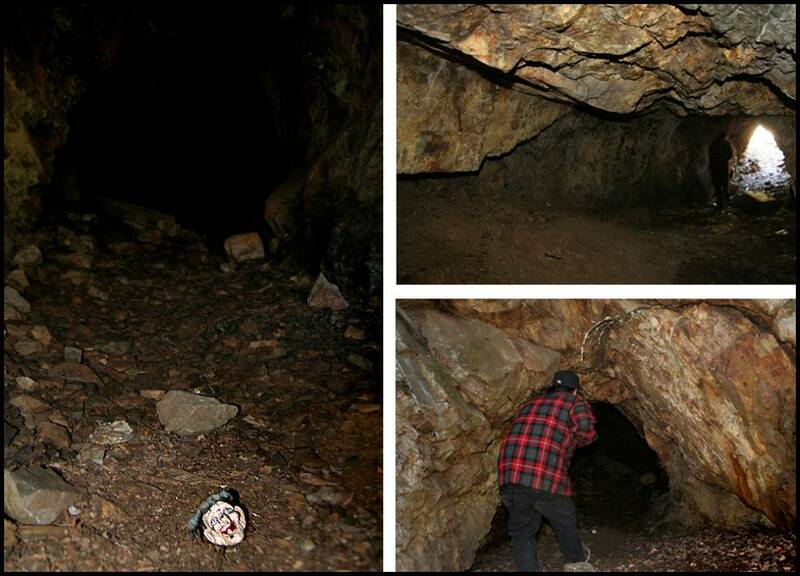 There was mention that there are mines open for exploring a little further southwest and so that’s where we headed. If you know where the flume is, it’s actually quite easy to find the largest mine. Walking down the hill you can see a rather immense, gaping cave that looks like the home to a large animal. This is one of the mines. What a rush it is coming upon it for the first time! We were greeted at the opening of the mine with a decapitated witch doll that looked like it was used for voodoo crafts! I love these sort of touches because it really adds to the rush! It was creepy indeed! We slowly made our way inside after yelling if anyone was inside. Not knowing how far in it went or what was inside darkness ahead was pretty scary. It turned out that the mine went back maybe 100 feet. I’m surprised we didn’t find a mountain lion or a pack of coyotes inside of it, although very thankful at the same time! The smaller mine is much trickier to see and we found it by chance. This can easily be overlooked, as we did the first time walking by it. It looks like a tiny den but once you crawl inside it gets much larger. This mine goes back maybe 25 feet which makes it a quick exploration. Both of these exploratory mines are southwest from the flume, maybe 100 yards up. Keep your eyes peeled and remember that the hunt is part of the adventure! Abandoned 1920’s arsenic mine near Black Mountain. Photos by Jessica Johnson.